I'm at a Networking Event--Now What??? �build networks and connections for your employment, business or social purposes. Chapter 1. What Is a Networking Event? Chapter 2. How Do You Prepare For a Networking Event? Chapter 3. Where Do Networking Events Take Place? Chapter 4. What Do You Need to Do Once You Are There? Chapter 5. What Should You NOT Do At a Networking Event? Chapter 6. What Do You Do After a Networking Event? Chapter 7. When Should You Stop Networking? Need help to expand your business perspectives? Find employment? Make contact with that one person that can open doors for you? Are you connecting with the right people? I�m at a Networking Event�Now What??? illustrates that today�s social networking environments practically demand that you have at least some knowledge of effective networking practices in order to achieve the results most of us are looking for. Through this book you will learn how to make quality connections, cultivate relationships, expand your circle of influence through networking events, and create good �social capital.� You�ll also find information on networking tools and technology that will promote new contacts and connections. For some, this book will serve solely as a reminder, but for many, it will offer new valuable insights on what to do, and just as importantly, what not to do while you�re out there working hard to maintain good standing within your social networks (on-line or otherwise), and striving to grow and nurture your own valuable social capital. You'll also learn why you might want to consider becoming a �pay it forward� focused person, as well as how to be more memorable. By the end of the book, you should feel empowered to take matters into your own hands and approach networking with a plan to achieve your goals. I'm at a Networking Event--Now What??? Networking should be like the holiday season--more about giving than receiving. "Jones-Kaminski and her consulting firm Bella Domain came up with a new approach to networking, called Pay It Forward Parties, or "PIF Parties," for short. Rather than going to a networking meeting looking to make connections for themselves, the attendees at a PIF Party have one objective: to offer whatever help they can to whoever asks for it." Read the entire NWJobs review. 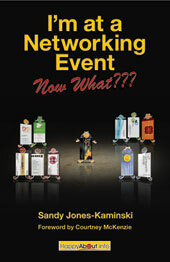 There are lots of successful ways to networking and many of them are described in detail in a new book by Sandy Jones-Kaminski. Sandy Jones-Kaminski is a self-described networking enthusiast and accomplished marketer and business development professional. In 2002, Sandy launched her own online marketing and biz dev strategy consulting practice called Bella Domain, LLC. She is also a former VP of Networking for one of the largest chapters of the American Marketing Association. Sandy knows how to make meaningful connections, cultivate relationships, host some great networking events, and create what she refers to as good “social capital.” You can connect with her at www.belladomain.com.